My daughter recently received a small giraffe stuffed animal and it’s been one of her favourite things ever since she got it. She named it Safari and it pretty much goes everywhere with her. Last weekend I thought I would make her a special lunch that she could enjoy with her stuffie. She absolutely loved it and gobbled up every bite. It was really easy to make too! 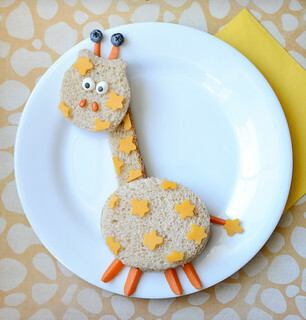 Here’s how to make your own giraffe sandwich at home. 1. Take 2 of your 3 slices of whole wheat bread and cut them into an oval shape, leaving just the crust. Place a piece of ham between these slices and set them on a plate for the giraffe’s body. 2. With the remaining slice of bread, cut out 1 piece for the giraffe’s head, and cut 1 end off the bread (including the crust) for the giraffe’s long neck. Place these on your plate. 3. Grab your small cookie cutter—if you don’t have one you can use a knife—and cut small shapes out of your slice of cheddar cheese. Place these cheese shapes all over the bread on the giraffe’s body, neck and head. 4. Grab your baby carrot and slice it into 7 thin slices: 4 for the legs, 2 for the horn-like things called ossicones, and 1 for the tail. Place these on your giraffe. 5. Take your 2 blueberries and place these on top of the giraffe’s horns. 6. Cut out 1 more piece of cheese and place this on the giraffe’s tail. 7. Take your 2 icing eyes and 2 chocolate-covered sunflower seeds and put them on your giraffe’s head for the eyes and nose holes. So silly and cute, your kids will just love it. Enjoy!